El Segundo, Calif./August 16, 2001- As an alternative to implementing electronic data interchange technology (EDI), business consulting and systems integration firm Syncata has put Linear Technology Corporation (Nasdaq: LLTC) onto the Internet to facilitate electronic commerce with distributor Arrow Electronics, Inc. (NYSE: ARW) using interoperable extensible markup language (XML) technology. "Linear has established a foundation for collaborative commerce using open standards in just 90 days," said Syncata Chairman Aloke Nath. "Arrow Electronics can now place orders and receive confirmations from Linear over the Internet. The Linear System even validates prices." "We are pleased to announce that Linear is now trading electronically with Arrow Electronics, thanks to the high-tech manufacturing c-Commerce group at Syncata, who completed the project on time and on budget," said David Quarles, Linear Technology’s Director of Marketing. Linear Technology engaged Syncata to deploy the business-to-business, electronic-trading system now in place. “It is Arrow’s belief in RosettaNet and our commitment to increase efficiencies throughout the supply chain which motivates us to lend our knowledge and experience to support changes in technology,” said Alan Napier, Vice President of Applications Development at Arrow Electronics, Inc. “We were pleased to participate in this effort with Linear Technology and Syncata, to allow for the exchange of purchase orders and confirmations over the Internet,” added Napier. Collaborating closely with Linear, Arrow Electronics played an active role in the process by specifying how they would exchange purchase orders electronically with Linear Technology, and by interfacing directly with Syncata using established protocols. Arrow Electronics uses the Peregrine/Extricity Alliance product suite as its middleware for RosettaNet electronic commerce. Using Microsoft's Biztalk Server 2000 Platform, Syncata effectively XML-enabled the chipmaker's business in just 90 days. The BizTalk Server implementation is among the first to make use of RosettaNet standards in a BizTalk environment. To achieve this, Syncata and Arrow Electronic’s RosettaNet team participated in the Biztalk Server Accelerator for RosettaNet beta, first announced in April 2001, which includes support for RosettaNet transaction and protocol specifications. After an extensive scoping phase, Linear and Syncata chose an XML-based BizTalk Server implementation as an alternative to EDI to quickly and cost-effectively engage with Arrow Electronics. The BizTalk Server implementation optimizes the process of information exchange between Linear and Arrow Electronics, facilitating improved collaboration and planning. Linear also gets an infrastructure that can grow with their organization through implementations of additional RosettaNet standards. Biztalk Server is Microsoft’s XML-based integration server, which helps companies connect applications and processes across their organization and the Internet. Utilizing secure Internet protocols and RosettaNet standards, Linear is slated to establish a leadership position in the use of the new electronic commerce technology with its business partners. The automation of many business-to-business transactions via this system will improve both the speed and accuracy of customer orders and communication, provide extensive cost saving vs. utilizing proprietary VANs, and enable richer data exchange and data management capabilities to both Linear and its partners. Syncata provides business consulting and systems integration services that help companies plan and implement innovative solutions for the extended enterprise. The firm helps clients collaborate effectively, plan adaptively and respond rapidly to enhance business performance and realize measurable value. Syncata assists clients in assessing strategic options and guides them through the detailed process of change management and technology implementation involved in delivering a practical solution. Syncata has over a decade of experience working across various industries including automotive, high-tech manufacturing, financial services and insurance. Linear Technology Corporation designs, manufactures, and markets a broad line of standard high-performance linear integrated circuits. Applications for the Company's products include telecommunications, cellular telephones, networking products and satellite systems, notebook and desktop computers, computer peripherals, video/multimedia, industrial instrumentation, automotive electronics, factory automation, process control, and military and space systems. The Company's principal product categories include amplifiers, high-speed amplifiers, voltage regulators, voltage references, interface, data converters, and linear circuits. Arrow Electronics is the world's largest distributor of electronic components and computer products, with year 2000 sales of $13 billion. Headquartered in Melville, New York, Arrow serves as a supply channel partner for more than 600 suppliers and 200,000 original equipment manufacturers, contract manufacturers, and commercial customers through more than 225 sales facilities and 23 distribution centers in 39 countries. 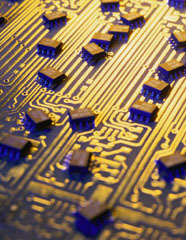 Arrow Electronics has been a leader in driving RosettaNet standards and implementations, with senior executive membership on the RosettaNet Electronic Components and Information Technology boards and exchanging multiple Partner Interface Processes (PIPtm) with suppliers and customers worldwide.